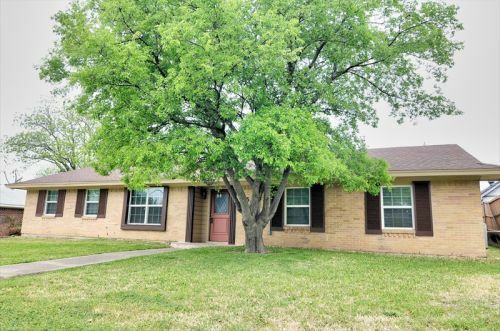 Hilites: Remodeled four bedroom house in Farmers Branch. Updated kitchen with new appliances. Baths redone with new vanities, tub and shower. New ceramic tile flooring throughout. New central heat and air. New water heater. Great location just north of LBJ at Marsh Lane . Appliances: New electric stove, new dishwasher. Furnish your own refrigerator. Central heat and air. Rooms Living room 16x13, dining room 11x16, den 19x15, master bedroom with private bath 16x10, three bedrooms 10x10, 10x11, 10x11. Utility toom for full size washer and dryer (not provided) 8x7, study 9x8. Terms: 1. Minimum 12 month lease. 2. Pets negotiable; deposits start at $500 if accepted. 3. Tenants responsible for utilities and yard maintenance. Misc: Carport. No garage. Fenced backyard. Built in 1959. Public school district: DISD.